Located about fifteen minutes from Avoca in the beautiful Pyrenees wine region of Victoria is the township of Moonambel. Like many parts of Victoria, Avoca and the surrounding district sprung to life when gold was discovered in the 1850's. Around this time, the nearby township of Beaufort boasted a population of over 100,000. Much has changed since the gold rush days, but the area hasn't lost any of its beauty. 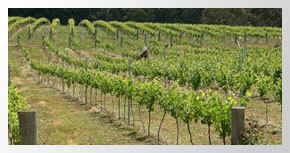 And with over 30 vineyards in the district, it has become one of the major wine growing areas in Australia. Moonambel is perfect if you want a peaceful, relaxing break from the tedium of every day liefe, but there's also plenty to do if you are feeling a bit more adventurous. Besides the many vineyards, we also have many local artists (including Barry right here at Tandamuki - see our Sculpture page). The Moonable Arts & History Group (MAHG) comprises local musicians, photographers, painters, printers, paper makers, mosaicists, sculptors, ceramists, theatre performers, craft makers, authors, publishers and historians. 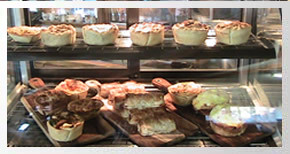 You could also have a gourmet pie or one of the many fresh pastries baked fresh daily at the Moonambel General Store, or drop in to the Avoca Visitor Information Centre for some helpful advice on the many nearby places of interest including bush walking tracks, art galleries and much more!